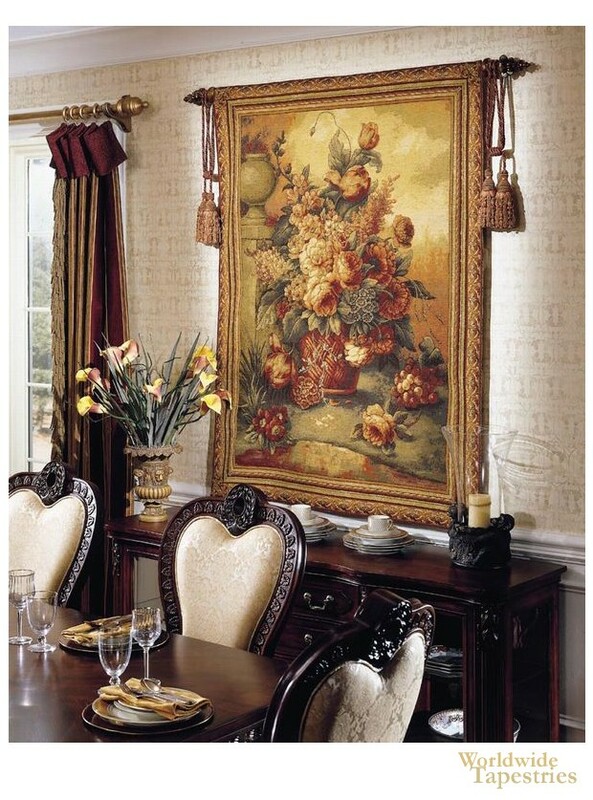 Generous Blooms tapestry shows an antique scene of peonies, tulips and roses in a garden scene. With flower blooms strewn onto the ground below, this is a classic French and Belgian floral still life scene, since the 17th century, where the beauty of flowers were a main subject of wall decor. Whether wall hangings were used to decorate palaces, castles or homes, the beauty of nature is brought into the interiors of a home with wall hangings. Here the bouquet of flowers are placed in the natural countryside on a grass clearing with a river in the foreground, a pillar and urn close by and a sky with atmospheric clouds. Full of beauty, this Belgian floral tapestry "Generous Blooms" is backed with a lining and has a tunnel for easy hanging. Note: tapestry rod, where pictured, are not included in the price. Dimensions: W 50" x H 66"